Summary of today’s show: Hundreds of young Catholics gather in the North End each spring for the annual Eucharistic Congress for College Students and Young Adults, together in prayer, service, and public witness including a Eucharistic procession in the streets with Cardinal Seán. Scot Landry and Fr. 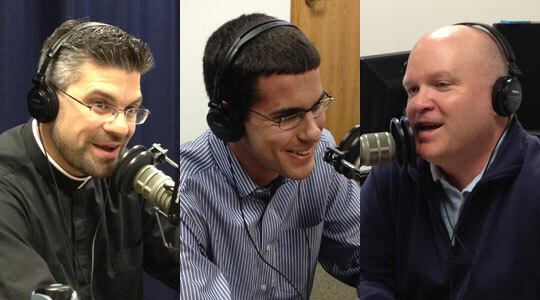 Matt Williams previewed the Congress coming up on April 27 & 28 with seminarian Patrick Fiorillo and Fr. Dan Hennessey, including the topic of “Ordinary People, Extraordinary Life” and the speakers: Cardinal Seán, Sr. Helena Burns, fsp, Damon Owens, and Fr. Derek Borek. 1st segment: Scot and Fr. Matt talked about celebrating Divine Mercy Sunday this past week. He celebrated Mass at St. Joseph, Holbrook, and at the state prison in Norfolk. He said it was an amazing experience to celebrate Mass there because of what the Lord is doing through the ministry there, including Cursillo and the Dominican Third Order. He’s been doing prison ministry for four years now and when he goes there, he finds God alive in their eyes. They give him a warm welcome each time. To be able to proclaim God’s mercy in a prison is humbling. He said they may be more free in God’s spirit than many people walking around the streets of Boston. They discussed Fr. Matt’s latest video blog on how to face your fears. Fr. Matt said, “Fear is useless. Trust Jesus.” Fr. Matt said the Pope coincidentally spoke about the fear the apostles faced. Fr. Matt also recalled how he preached this past Sunday on the 100th anniversary of the sinking of the Titanic. In the midst of the tragedy, there was another vessel bringing great hope. It was the priest, Fr. Thomas Byles. On that evening, when the Titanic hit the iceberg, he was praying the Divine Office. He ultimately made his way to the deck and assisted people into the boats. At least twice, he refused to get into the boats. Instead, he heard confessions, prayed the Rosary, and helped people turned to the Lord. One of the last recollections of him was being surrounded by people of all faiths on their knees while he prayed for them. God’s mercy came to them as they prayed for their deaths. He was a vessel of God’s mercy. 2nd segment: Scot and Fr. Matt welcomed Patrick Fiorillo from St. John’s Seminary. He said he’s from St. Mary in Franklin, Mass. He studied music production at University of Hartford. He heard the call to the priesthood about halfway through college. With a bachelor’s degree, he will study philosophy for two years and theology for four. His favorite class right now is on the topic of the study of the soul. Patrick said he’s a drummer, playing jazz and rock, andy hat’s what got him into music school. He later fell into classical music and that became the focus of his recording engineer career. He took up singing as a hobby and that became part of the practice of his faith. He now sings sacred music and sings in the choir and cantoring. He said he was literally tone deaf before entering college so the fact he can hit the right pitches is miraculous to him. Patrick said he doesn’t play drums in a sacred context yet, but he does play timpani on certain sacred music occasions. There are about 15 men in the the 2nd year pre-theology class. They study Latin, Greek, SPanish, the Catechism, and two courses of philosophy each semester. At the Eucharistic Congress, he’s leading music. He’s planning some new hymns and some old ones, plus some chants from the new Roman Missal. He hinted at a secret selection that’s both centuries old and brand-new at the same time. 3rd segment: Scot welcomed Fr. Dan Hennesey to the show. Scot said the Congress is co-sponsored by the Office for Vocations, Office for Campus Ministry, and Office for the New Evangelization of Youth and Young Adults. Fr. Dan said they planned it five years ago to bring together college students and young adults. He said a lot of students and young adults they might not have opportunity to meet other Catholics their age to socialize and pray with. One of the inspirations for the Congress was Bl. Pier Giorgio Frassati, a young man at the beginning of the 20th century in Italy. Fr. Dan said Bl. PG used to go to Mass every Saturday before going to visit the poor, bringing them gifts and doing chores around their homes, paying their bills, and so on. One day, his friends were going hiking and they wanted him to come instead of going to Mass and serving the poor. He said when he goes to Mass, the Lord visits him in his home, his soul, and in the afternoon, he returns the favor by visiting the Lord in his home, among the poor. So in this Congress, they visit the Lord in the Eucharist and among the poor. This year, the Congress is Friday evening, April 27, and Saturday, April 28, in the North End of Boston. Fr. Matt said the North End is a beautiful old Italian-American neighborhood. They’ve been doing the Congress for five years now and people have become used to them. The weather is usually cooperative and it’s an opportunity see the city and meet other people. Scot asked Patrick why all this comes together so well in the Congress. Patrick said the summit of the event is a public procession of the Eucharist in the evening through the streets. He said not everyone experiences Eucharistic adoration. So they get adoration, procession, Mass and service in a package you don’t get to experience any other time. Scot said Eucharistic processions are more uncommon today. Patrick said this was his first Eucharistic process last year. It was a powerful experience walking the streets among people just out and going about their business. The people see it and know right away that this is not just a typical cultural Catholic gathering. Fr. Dan said it’s amazing to behold the procession. One year it was so freezing cold and as they were walking they imagined it must be a witness to faith. He’s heard about stories of moments of conversion in the hearts of those observing. He said very often they will walk by a group of people and they offer a candle to them and ask them to join in. He notes that people are usually reverent and respectful, even if they don’t understand or don’t believe as we do. Fr. Matt said a nice addition to the Congress has been places where they stop, place the Eucharist on an altar, and everyone kneels down. There are at least three locations, including right outside St. Leonard’s. People can’t help but ask what is going on here. If you’re Catholic, it has to at least trigger the question of what you really believe. He said as they cross Hanover Street, which holds traffic for up to five minutes, and all the people come to the windows of the restaurants and even come outside. He recalls seeing people actually sobbing as they watched. Scot asked why they end with the procession. Fr. Dan said they are ending by sending people out as missionaries. The procession is the first step in the mission and the witness is part of that mission. Fr. Dan mentioned the story of one young woman who had been looking at graduate schools around the country, including Boston, so when she Googled “Boston” and “Catholic” and saw their website and all the pictures of the Eucharistic Congress and that convinced her to come to Boston. Scot said the bulk of Saturday is witnessing through service projects. Fr. Dan said each year, they have their mainstay service projects and they add some other ones. They send people to Boston Common and the public gardens with the Little Brothers of St. Francis to visit some of the homeless to bring food and clothing and be with them. Another project includes visiting the inform priests, doing cleanup around the neighborhoods or doing a spring cleaning at some of the parishes. Cardinal Sean is always involved in the Congresses. Fr. Matt said the cardinal has a great love for young people. He celebrates the Mass on Saturday evening and then joins them for the dinner after. He then joins the Eucharistic procession. He wins Praying with Blessed Pope John Paul II (Companions for the Journey). 5th segment: Scot said the theme for the Congress this year is “Ordinary People, Extraordinary Life”. Fr. Dan said it means that to live the Catholic live, it is an extraordinary life. Everyone wants a life with meaning. So they wanted to have someone speak on being drawn into the extraordinary life. There are three keynote speakers. Sr. Helena Burns, fsp, speaking on Bodies Are Not Optional: Living Catholic in the Digital Age, asking what it means to be human online. Our use of media technology is altering our bodies, influencing our minds, wills, and hearts. Our media use is changing us as human beings. But what does it mean to be human? How can we use media in a way that is truly human and never de-humanizing? Social media is a significant part of the lives of young adults and she speak to their experience. Scot said the Daughters of St. Paul have been pioneers in the Church with new media. Fr. Matt Sr. Helena is currently involved in working on a film about the life of their founder, Bl. Alberione, and has studied screenwriting. Scot asked Patrick how social media affects young adults. Patrick said it can have the tendency to dehumanize. Facebook friends can become substitutes for real friends. On the positive side, it can be used as a tool to evangelize. On Saturday, Fr. Derek Borek from St. John’s Seminary will speak on what it means to gather at the Eucharist every week or every day and what does it mean to give ourselves away in love outside of the Mass. We are called to imitate Jesus’ self-giving, being blessed and broken and given like the Eucharist. In the evening, Damon Owens of the Theology of the Body Institute, will speak on “Working out Salvation”. Fr. Matt said Damon is a nationally recognized speaker on marriage and theology of the body. He also has a background in Opus Dei, which contributes to his talk on connecting our worship and our work. We are to sanctify our work, sanctify ourselves in our work, and sanctify others through our work. Work, for the believer, should be a joyful occasion for us to “work out our salvation”. The seriousness and devotion by which we take our work can sanctify our work and sanctify us. Patrick said it’s important for us to get out and experience the universal Church outside our own parish groups or our experience of the Church will be limited. A big part of his conversion was experiencing the wider Church in all the different ways people are living out their faith and seeing how it all comes together in the Body of Christ. Fr. Matt said after Mass with Cardinal Seán, they will make their way across the street for dinner in the school cafeteria, which is catered by a number of the restaurants of the North End. Many restaurants donate food, enough to feed 650 people. The music in the evening program will also be provided by Jon Niven, who will do some praise and worship, followed by Damon’s talk, then adoration, then the Eucharistic procession. To register, go to the website link above.